Soldiering on ... but what's causing this growth in presenteeism? Many organizations cite employee well-being as a top priority, but despite this, research from the United Kingdom shows that an increasing number of people are turning up at work when they are unwell. Cases of “presenteeism” in the workplace have more than tripled since 2010, according to a survey of more than 1,000 organizations in the UK by the Chartered Institute of Personnel and Development (CIPD) and health insurer Simplyheath. More than eight in 10 (86%) respondents said they had noticed incidences of presenteeism in the past 12 months. This is in comparison to 72% when the survey was conducted in 2016 and just 26% in 2010. Yet, according to those surveyed, only 25% of organizations are taking steps to discourage this trend, down from almost 48% in 2010. The report also highlighted that the issue of “leave-ism” – when employees work during annual leave, flexitime or rest days – is on the rise. More than two-thirds of employers said leave-ism had occurred in their organization during the past year. Only 27% of employers who had observed staff working while on annual leave said their organization was tackling the issue. Unhealthy working patterns can be associated with mental health conditions and stress-related absences, and the report shows an increase in reporting of anxiety and depression compared to 2016. It also shows heavy workloads are the most common cause of stress at work, with almost two-fifths (37%) of respondents saying cases of stress-related absence had increased over the past year. Rachel Suff, Senior Employment Relations Adviser at the CIPD, said: “The survey shines a light on the shocking scale of presenteeism and leave-ism we have in the UK, as people feel under even more pressure at work. The problem of presenteeism and leave-ism is not just limited to the UK. A 2012 study from non-profit health and productivity research organization the Integrated Benefits Institute (IBI) estimates that the lost productivity due to presenteeism in particular costs the United States economy $227 billion per year. Overall, the impact of ill health on productivity costs the US economy $576 billion per year, the IBI study shows. Sean Nicholson, a Cornell University economist who is researching the link between health and productivity, said: "The literature shows that employers can save an average of $3 for every $1 they invest in improving their workers' health, so there are opportunities for companies to increase profits and wages while they improve worker health." The CIPD/Simplyhealth report outlines a series of actions that human resources (HR) departments can take to improve health and well-being in their organizations. According to the report, understanding underlying patterns of absence and attendance is crucial. While most organizations surveyed collect "absence data" (though there is a lack of data on presenteeism because it is harder quantify), few use this information to inform well-being strategies. 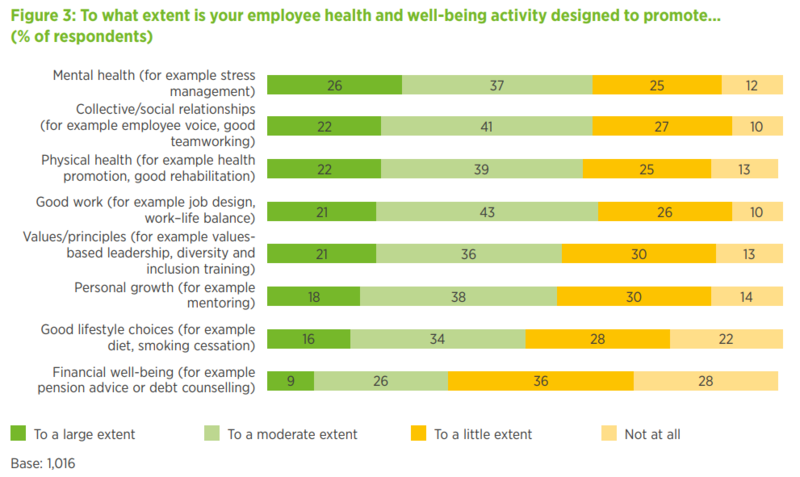 “Unless well-being activity addresses the underlying issues affecting people’s behaviour, efforts to support employees and improve health and well-being will be short-lived,” the report warns. It advises building “an open and inclusive culture” that promotes mental health and provides employees with the confidence to discuss mental health issues and the challenges they may be experiencing. “Organizations have a responsibility to manage stress and mental health at work, making sure employees are aware of the services and support available to them and how to access them,” the report says.